Do you trust the FBI? 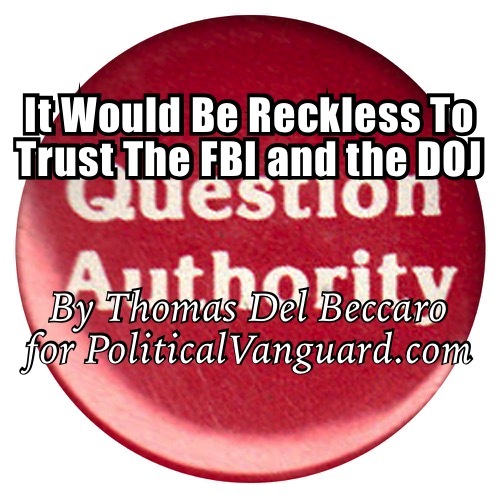 Do you trust the Department of Justice? For years the Left told America to Question Authority. Now, however, as Michael Goodwin puts it “Evidence Suggests a Massive Scandal Is Brewing at the FBI, the Left doesn’t want us to question the FBI, the DOJ or Robert Mueller the Special Counsel. Chuck Grassley is not exactly a reckless firebrand. So they can do what with that review? The answer is to block its publication and prevent the exposure of what they have done to America. It would be reckless for our Republic to simply going along at this point. Nunes and Trump should not fall for it. It is time to question authority.